Well, it has been just over a month since my last post. I must apologize to any regular readers of this blog for this extend period of silence, yet there is a very excusable reason. Early last month, I was sent the pageproofs for my forthcoming book, the release date for which is Oct. 11th, 2011, to read over one last time for any minor corrections that I would like to make. In addition, I had to compile my index. Now, if you have not created an index before, it actually is a fascinating intellectual exercise. A writer is forced to map the book’s discussion in such a way as to offer entrance points for readers. I think it is comparable to the connect-the-dot coloring books I use to have as a child, the ones where the picture of a dragon or whatever begins to form as one draws the individual lines. A fascinating, well-argued comparison between Francis Bacon’s narrative of recovering human dominion over nature and 17th century skeptics who deny its possibility. Funari draws insightful parallels with today’s proponents of technological solutions and environmental philosophers who propose new ways of living with the more-than-human world. Of interest to anyone who wishes to see how history and literature can inform the roots of today’s environmental crisis. Alright, then, now to the Renaissance in today’s culture. Some of you may know that today actually commemorates Henry VIII’s beheading of arguably the greatest intellectual figure of English history, Sir/St. 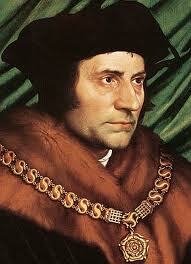 Thomas More. The portrait of More as Lord Chancellor. In 1534 to further his attempt to divorce Catherine of Aragon and marry Ann Boleyn, Henry VIII pushed through Parliament the Act of Supremacy, essentially establishing the Episcopal Church and declaring himself supreme head. To add a side note here, Henry’s break with the Roman Catholic Church was partially precipitated by events happening on the Continent: Catherine’s nephew, the Emperor Charles V, was essentially holding the Pope Leo X hostage while Henry petitioned him for a divorce. In the image of the martyr who died resisting Henry VIII’s tyranny, I think an important facet of More’s character is often overlooked – his sense of humor. (Erasmus, the European intellectual of the early 16th c., dedicated his most well-known book, The Praise of Folly (1509), to More. The Latin title of The Praise of Folly [Moriae Econium] is actually a pun on More’s name.) 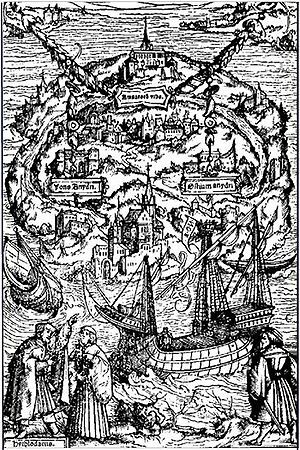 The work of More that best conveys his sardonic wit is Utopia (1519). This is the frontispiece for the 1516 edition. It is a map of the fictional Isle of Utopia. 2) In his description of the cultural rituals, Hythlodeaus recounts the custom of the betrothed couple having the opportunity to see each other naked prior to being wedded. If we take More as being sincere here, he is being incredibly progressive, suggesting the importance of sexual compatibility for a successful marriage. Before delving into his account of Utopia, Hythlodeaus tells More that had he seen Utopia firsthand like he himself had and live there for five and half years, “then doubtless you would grant that you never saw people well ordered, but only there.” Here Hythlodeaus voices the irony that pervades More’s text: unless you have actually lived in Utopia you will never be able to live in Utopia. Or as Clarence H. Miller states in his introduction to the Yale University Press edition: “We are always being brought back to the basic paradox: the institutions cannot be introduced unless they have already been introduced” (xvi). Excellent! Thanks for the rec, and the post! You have inspired me to tweet. My only real connection with Utopia is the movie Ever After (starring Drew Barrymore. I know. This is probably shameful to me). She’s fighting to get her friend – a fellow servant – out of his soon-to-be enslavement in the Americas and quotes Utopia: “If you suffer your people to be ill-educated, and their manners corrupted from infancy, and then punish them for those crimes to which their first education disposed them, what else is to be concluded, sire, but that you first make thieves and then punish them?” The quote works. So Thomas More is a beast, apparently. I believe other website owners should take this site as an model, very clean and fantastic user friendly design . “It is the sign of a week mind to be unable to bear wealth.” by Seneca.